PEAK Audio Video is well known for our expertise in the restaurant, retail, and hospitality markets. Our custom commercial installations can be found throughout the Maritime provinces. We specialize in sports bars, and have substantial experience in fine and casual dining, as well as fast casual restaurants. We’ve also installed custom AV systems in large retail spaces, auditoriums, conference and training rooms, warehouses, and factories. We’ve designed and executed some of the most impressive commercial cinema and AV systems in Atlantic Canada. We provide complete project management services and work with a full range of tradespeople. We can also work with your current contractor. 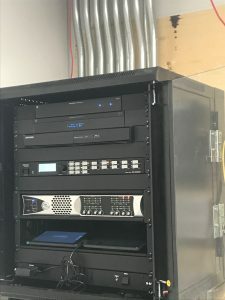 PEAK Audio Video has designed and executed a wide range of completely customized commercial AV systems across Atlantic Canada. We provide tailored solutions at every price point. PEAK Audio Video supplies auditorium, classroom, and theatre seating for residential and commercial venues of all sizes. PEAK will provide CAD drawings and manage your project from the first phase to completion. PEAK Audio Video has relationships with the most reputable manufacturers of prefabricated and custom room treatments. Using advanced computer modeling and a deep understanding of acoustics, we can predict how sound will behave and respond within any given space. This technology involves adding sound created by special digital generators and distributed by unseen speakers to area to reduce distractions or provide privacy. Masking operates by covering up or masking unwanted sounds.